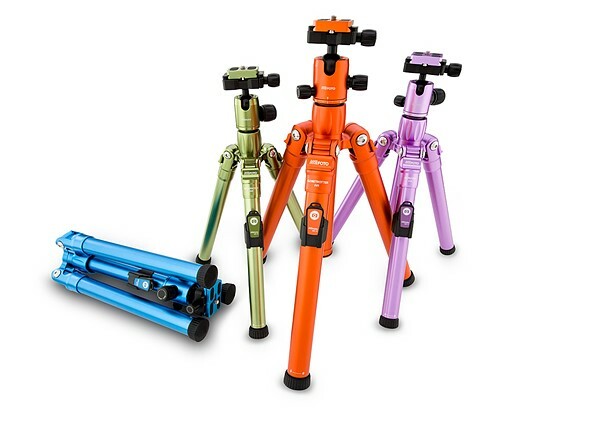 MeFoto has announced a line up colorful, re-designed travel tripods. The MeFoto Air series offers a new leg lock design it’s calling HyperLock, which uses a single locking point for each leg in an effort to simplify setup and break down. The MeFoto Air has another interesting trick up its sleeve – by removing the center column and attaching an included phone clamp, the tripod can be converted into a selfie stick. A Bluetooth remote attaches to the handle so the user can remotely trigger his or her mobile device. The Air series will be available starting November in plenty of bold colors and in a variety of sizes, including a monopod. COLOGNE, GERMANY (September 20, 2016) – MeFOTO is proud to introduce a new line of colorful and compact tripods and monopods — MeFOTO Air. Offering exceptional value and performance, MeFOTO is sure to capture the attention of photographers in search of a lightweight and ultra-portable camera support solution. Featuring HyperLock, MeFOTO’s revolutionary new leg lock system, the line boasts a unique combination of durability, functionality, speed, size and style, offering users endless new creative possibilities. Engineered from the ground up, HyperLock is one of the most advanced leg locking systems found on any tripod today. Typically, a tripod or monopod features a locking mechanism for each leg section, forcing users to adjust each individually in order to ensure stability. With HyperLock, users need to only interact with one locking mechanism per leg. One small turn unlocks and extends the entire leg, and with a simple reverse twist, the legs lock back into place. By revolutionizing the leg locking mechanism, MeFOTO Air drastically reduces the time needed to setup and breakdown. Once folded up, the ultra-compact and lightweight tripods and monopods fit easily inside small and medium sized bags. The MeFOTO Air series will be offered in a variety of sizes, including MeFOTO’s BackPacker, RoadTrip and GlobeTrotter tripods and the WalkAbout monopod. MeFOTO Air will be available beginning November 1, 2016. For a full demonstration on the functionality of MeFOTO Air, please visit https://vimeo.com/182870823.